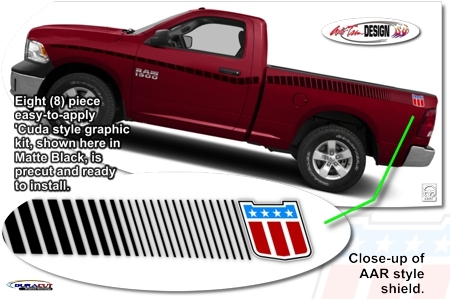 Trick out your '09-Current RAM Truck with this retro style AAR 'Cuda Style Body Side "Strobe" graphics kit. This easy-to-apply eight (8) piece kit is packaged as PRECUT pieces which are ready to install in a wide variety of colors - NO TRIMMING required (slight trimming required for truck boxes equipped with RamBox Cargo Management System)! Kit comes with optional AAR 'Cuda stylized shields as shown in image. This kit is specifically made for the '09-Current Dodge Ram Truck Regular Cab Short Box pickup and will not fit any other vehicle. Graphic kit is vehicle specific and will not fit any other vehicle. Kit WILL NOT fit other models of RAM Truck such as Quad Cab, Crew Cab or Long Box pickups.